Most histories of postwar American politics say almost nothing about the millions of Americans who opposed abortion before Roe v. Wade. They do not mention the African Americans in Detroit, the Lutheran wheat farmers in rural North Dakota, or the Catholics in Midwestern parishes who mobilized on behalf of the unborn at the beginning of the 1970s. They do not discuss the pro-life movement’s success in defeating abortion liberalization proposals in dozens of state legislatures and ballot initiatives in 1971 and 1972. Nor do they include much information about the pro-life movement’s failures in the late 1960s—or its quiet successes a few years earlier. [They] treat the pro-life movement—if they mention it at all—only as a reaction against Roe v. Wade, the feminist movement, the sexual revolution, and the growth of federal power. . . . This consensus has largely been established by historians of abortion rights activism, and the activists they study have almost invariably understood the motives of their opponents. As a result, historians have mischaracterized both the chronology of the pro-life movement and its ideological origins. Pro-life activism actually began decades before Roe v. Wade or the formation of the National Organization for Women. And it originated not as a conservative backlash against individual rights, but as a defense of human rights for the unborn. Because historians have misunderstood the pro-life movement’s origins, they have been unable to explain why it remains a potent political force today, long after other socially conservative, religiously inspired causes, from Prohibition to school prayer, have faded from the scene. If the opponents of abortion had based their opposition merely on religious teaching or the seemingly arcane principles of natural law—as Catholics had when campaigning against contraception—it is unlikely that the pro-life cause could have withstood the force of the sexual revolution, the feminist movement, and the social changes of the 1960s. But because the pro-life movement grounded its arguments in the language of human value and constitutional rights, it was able to attract a politically and religiously diverse coalition that actually gained strength over time. The pro-life movement succeeded because it drew on the same language of the human rights, civil rights, and the value of human life that inspired the struggle for African American freedom, the feminist movement, antiwar protests, and the campaign for the rights of gays and lesbians. This book offers an intellectual and political history of the pro-life movement. I argue that the movement’s origins and endurance can be explains by its rights-based paradigm and its utilization of the language of postwar American liberalism. The pro-life cause originated at a far earlier date than historians have previously thought, and its origins were not tied to a backlash against the women’s movement, but instead to a concern about the consequences of the nation’s disrespect for human life. 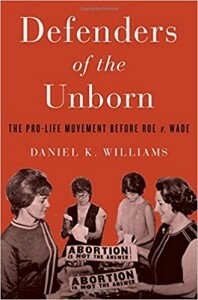 This book also challenges conventional presuppositions about the pro-life movement by showing that it originated not among political conservatives, but rather among people who supported New Deal liberalism and government aid to the poor, and who viewed their campaign as an effort to extend state protection to the rights of a defenseless minority (in this case, the unborn). Only after Roe v. Wade, when the pro-life movement’s interpretation of liberalism came into conflict with another rights-based movement—feminism—and it became clear that pro-lifers would not be able to win the support of the Democratic Party, did the movement take a conservative turn. Yet because of the movement’s liberal origins, its position in the Republican Party remains an uneasy one even today.